Can I Play Lotto Max Online? Read Reviews! Lotto Max Exposed — Totally Tax Free! Canada’s Lotto Max is a fairly new game to the country. Starting in September 2009, replacing what was formerly the Lotto Super-7, the Lotto Max has become one of the biggest jackpot games that Canada has to offer. Drawings for the Lotto Max take place only once per week, a rarity in the jackpot world. Tickets go off sale at 9:00 PM eastern time and the drawing takes place shortly after. It’s a fairly expensive lottery jackpot game as you have to fork over $5 for three sets of numbers and players are charged with picking seven numbers between 1-49 for each set, meaning you’re picking 21 numbers altogether. You must match all seven numbers in order to win the major jackpot and your odds of doing so come in at a manageable odds rate of 1 in 28,633,528. I say ‘manageable’ odds because the Powerball, a comparable jackpot game based in the United States, has staggering odds of 1 in 175 Million. One of the things that separate Lotto Max from some of the major jackpots throughout other countries is their Maxmillions concept. 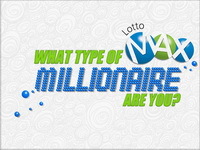 Maxmillions comes into play whenever the Lotto Max jackpot stretches above a $50 Million jackpot. Once this happens separate drawings take place for every million over $50 Million, in which players can win $1 Million dollars for matching 7 out of 7 numbers. So basically if the jackpot reaches $55 Million dollars there would be five separate Maxmillions drawings for $1 Million each and then the usual Lotto Max drawing for $50 Million. Your Lotto Max ticket can be used for Maxmillions so there’s no need to purchase more tickets. It’s basically just a concept to give you more opportunities to win, although you still have to match the same amount of numbers as you would win the major jackpot. Man, imagine hitting that $1 Million Maxmillions jackpot instead of the $50 Million major jackpot. That’d be awful, wouldn’t it? Well, I guess I might be able to find room for $1 Million in my wallet. Who’s In Charge of Lotto Max? The Interprovincial Lottery Corporation oversees the day to day operations of Lotto Max. They are also in charge of one of the other big Canadian jackpot games, Lotto 6/49. The Lotto Max, like any jackpot game, has its fair of scams associated with it. The most recent one comes after Tom Crist, a Canadian native, won the jackpot and pledged to give away $40 million of his winnings to charity. Soon after, scammers were emailing multiple US residents that had been going through hard times claiming that they were Crist and were willing to give $2 million to help get the families through their tough times. The only catch associated with receiving the $2 million was that the families would have to pay $550 for insurance and banking costs. As you would expect the transferring of the $550 would be the last contact that the hardship families would have with the con artists. The lesson I’d hope people would learn from scams like this, always be skeptical. You gotta be pretty darn gullible to get hit with a scam like this. Do your due diligence before even thinking about sending any money whatsoever. C’mon people!! Would you mind rating Lotto Max? While there are better jackpot games out there, Lotto Max provides an intriguing and unique option. Tickets are an absolute must-have whenever the jackpot reaches over the $50 million mark and forces the extra Maxmillions drawings, but I’m going to be sticking to buying them once or twice a month otherwise. I love Lotto Max. It’s one of the games that I’ve consistently won bits and pieces and one of the lotteries that I’m in a pool. We’ve won enough in that, that we haven’t had to add further money in for a long while. The jackpot grows and grows – and is tax free. I love waking up and checking my numbers on Saturday morning. I am still trying to find an online lottery/syndicate that will sell tickets for Canadas Lotto Max. The link you provided at the start redirects to Canadas 6/49. Thanks for your help!